The remuneration data provides essential staff budgeting and planning information for all businesses in the staffing and recruitment industry. With 4 data sets across 27 function job titles and further analysis around staff remuneration issues, this is the most comprehensive data available in the market. Leverage this industry data to accelerate team performance and manage your hiring process and staff retention. Participants in the survey gain access to the SIM interactive dashboard which is continually updated and provides specific analysis of your company to the benchmark. Participants also receive a copy of the ANZ Remuneration Report. Those who do not participate in the survey are able to purchase a copy of the report which is updated annually. 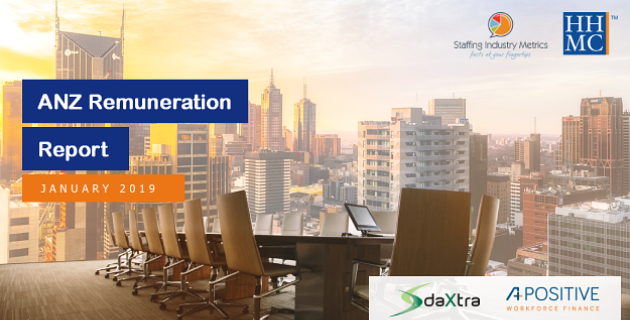 The data has been collected across Australian and New Zealand recruitment agencies – it is of strategic value to agency owners and managers in Australia, New Zealand and throughout Asia, as well as organisations seeking to participate in the Asia Pacific staffing and recruitment industry.